After years of battling Samsung and other Android phone makers in the brutal mobile patent wars, Apple now faces another IP struggle, this time in the audio arena. Beats, the headphone and streaming company recently purchased by the folks from Cupertino, has been sued by rival Bose over its noise-cancelling patents, CNBC reports. 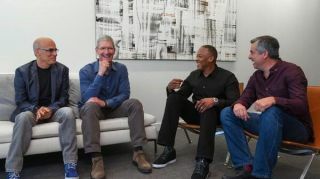 Bose is alleging Beats robbed 50 years of its development and engineering nous and claims Beats' current line-up infringes upon 36 patents or patents currently pending. The products under question include the new Beats Studio and Studio Wireless lines, which Bose says uses tech that mimics that deployed by its own QuietComfort range and its military and industrial designs. Bose says its founder came up with the idea for noise-cancelling headphones on a flight in 1964 and all of the patents it has filed since have been to protect "inventors' recognition of the unique technical problems associated with constructing improved high-performance noise cancellation headphones," according to the documents. The Bose lawsuit joins existing litigation from the likes of Samsung and comes at an inconvenient time for Apple, which shelled out a recorded $3 billion (about £1.8b, AU$3.2b) in May. Apple nor its Beats subsidiary have responded to the lawsuit at the time of writing.